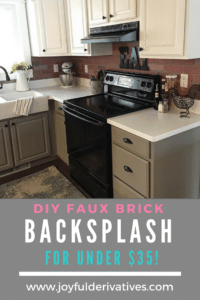 Joyful Derivatives » Blog » DIY Home Improvement » DIY Kitchen Makeover Ideas that will Transform your Kitchen on a Budget! DIY Kitchen Makeover Ideas that will Transform your Kitchen on a Budget! 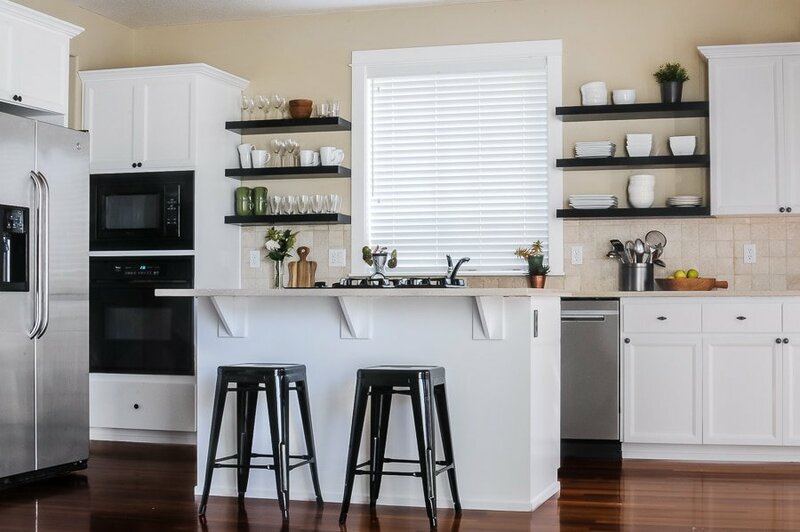 These affordable kitchen makeover ideas will show you how to completely transform your kitchen without spending thousands of dollars! Use these ideas to give your kitchen a fresh, updated style on a tight budget! Kitchen makeovers are a lot of work. I mean, typically, 75% of the cost to our clients in kitchen makeover projects, is labor. 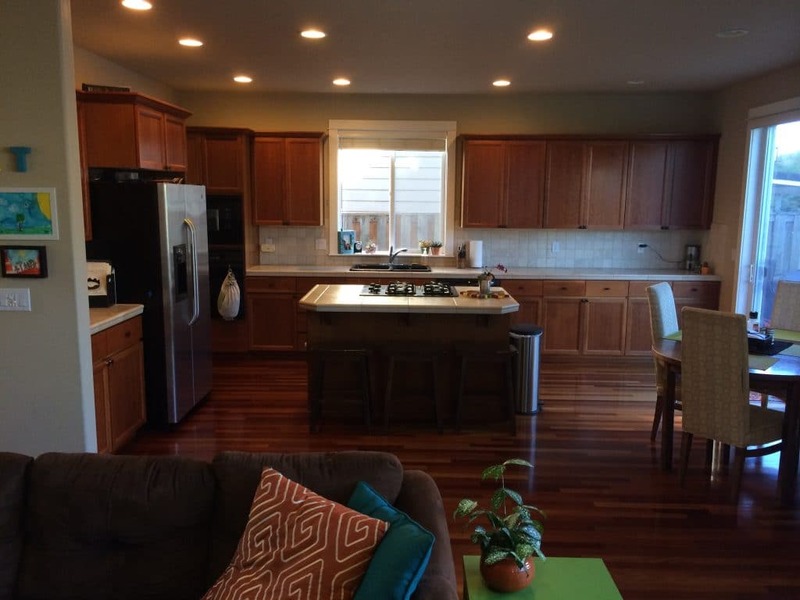 BUT, if you’re willing to put in the time and hard work, a DIY kitchen makeover is SO WORTH IT. With a DIY kitchen makeover, you can completely change the look of your kitchen on an extremely small budget! So, today I’m giving you my favorite ways to update a kitchen when doing a DIY kitchen makeover. 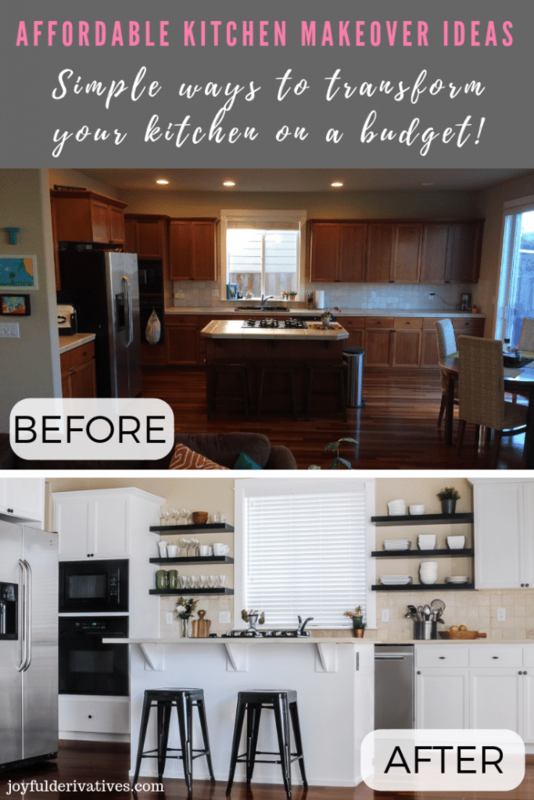 I’m hoping these ideas will help guide you through your kitchen makeover and get you a fresh, updated kitchen for super low cost! I can’t say this enough – the easiest way to update and modernize your kitchen is to paint the cabinets. While this is the most time intensive suggestion I’ll be giving you, it’s also the most impactful! Also note, while we typically see people wanting to change their cabinetry from stained wood to bright white – that’s not the only option! Our cabinets were actually pink when we bought our house, and we chose to paint them white on the uppers and grey on the lowers for the main cabinetry and white for the island. Any new color will change the look of your kitchen and give it a fresh, updated style! 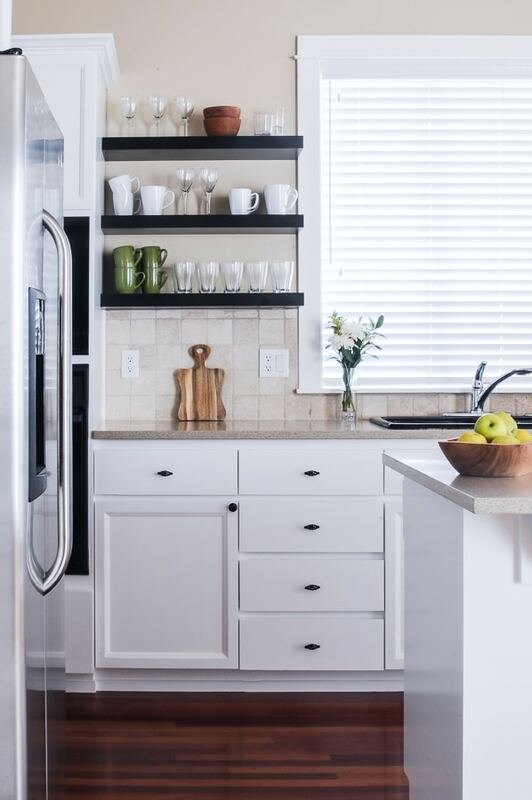 One type of open shelves that are really popular are floating shelves (meaning they don’t have any support brackets or corbels holding them up.) 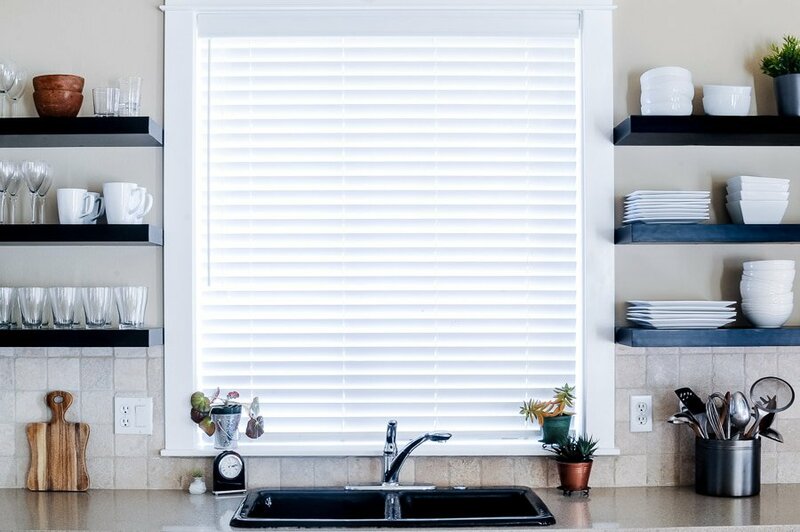 If your kitchen allows for them, I’d highly recommend installing floating shelves! The ones we installed for our clients are from IKEA. We simply used a chop saw to trim them down to size and put the cut end of the shelf against the cabinetry. 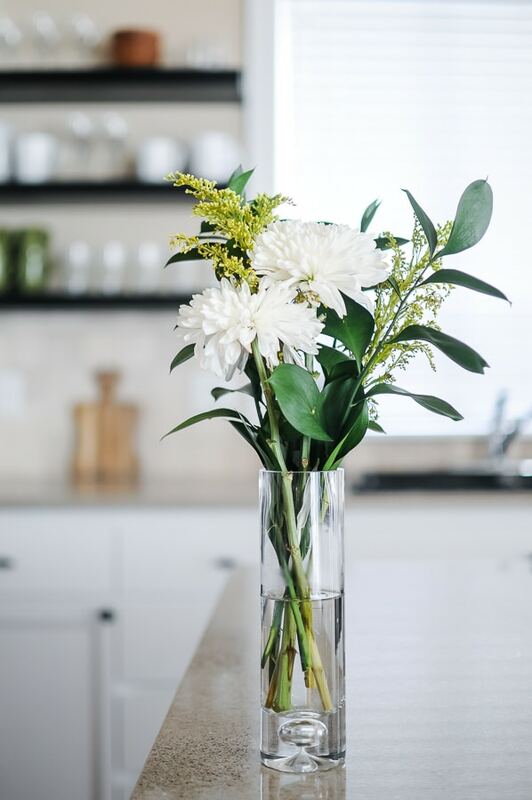 One of the easiest ways for a kitchen to get cluttered and messy is by having a “drop zone” where everyone sets their stuff when they come into the room. To help eliminate this issue, remove one of your base cabinets in a corner section of your kitchen and designate that space as the kitchen desk! 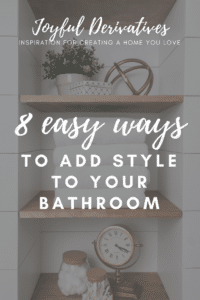 From there, organize the space like an office – hang file folders for paper, outfit one of the cabinets beside the desk to include pens, paper, books, etc. The one thing you’ll have to think about when removing a base cabinet is whether there is flooring underneath the existing cabinetry. You may end up needing to patch the flooring and add floor trim around the new desk opening. In addition to painting your cabinets, another high-impact update that’s extremely easy is updating your hardware. If you don’t want to spend the money to buy all new knobs and pulls, simply give them a coat of spray paint! Changing the hardware from nickel to black or oil-rubbed bronze to gold can drastically change the look of your kitchen. A fun way to add some bold style to your kitchen makeover is by furnishing the island, peninsula or bar with high-contrast stools or chairs. 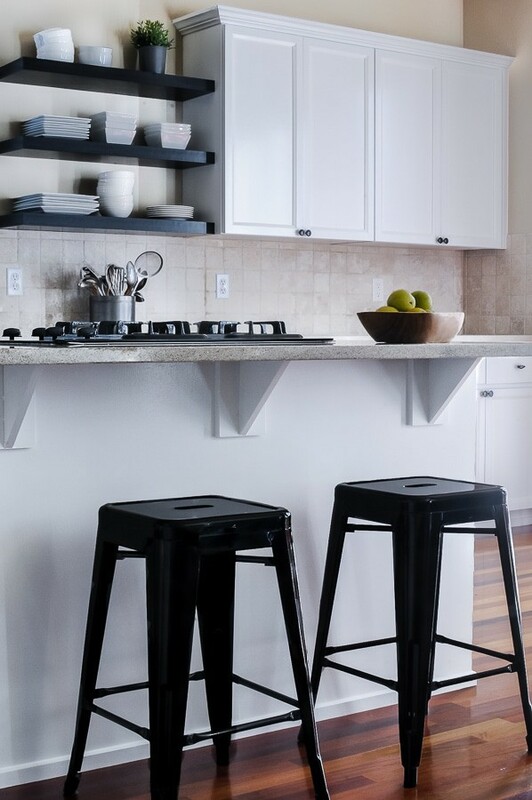 If you have light and bright cabinetry, try dark stools. Dark cabinetry? Try white or brushed nickel! Or, if you’re feeling really adventurous, try a bold color like yellow or pink! The contrasting color of the stool will make the seating stand out and keep the eye from noticing the boring, large expanse of cabinet backs underneath the seating area. 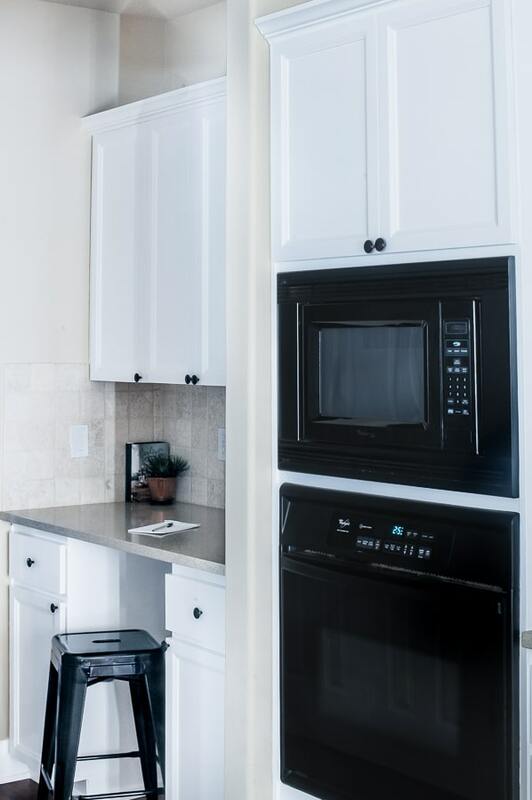 Now, let’s review the total cost of a DIY kitchen makeover that includes all five of these easy and affordable updates. Impressive ideas. Thanks for sharing this wonderful post about diy kitchen makeover ideas. It’s very informative and helpful. I really fall in love in your kitchen. Its decorations impressed me very much and I would like to decorate my room like this. Thanks for writing on this topic. I was searching for getting a color scheme idea of kitchen cabinets. I got your article and learned lots of things with it.